Transform your space – and your art – with this deep cherry picture frame. The warmth of the wood and the wood-grain tones on its flat profile add interest, so your latest canvas will be stunning! It’s also a beautiful family photo frame, wedding frame or fine art print frame. Handmade by our Artisans from natural wood grown in sustainably managed forests. Custom sizes to 1/8th of an inch! Your art. Your way. Excellent quality. Fast shipping. The frame compliments the image. I hope it works with the piece I painted. Difference between GLD and GLK frame? Thank you for your inquiry. The difference in the two frames is in color and texture. We recommend ordering free 3" samples of the two frames so you can see the difference and choose the right frame for you. do you have frames that are solid wood with natural grain ? 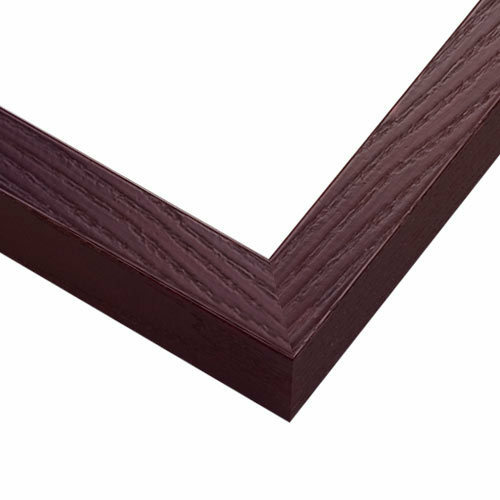 We certainly have frames that are solid wood with natural grain. Please see the link below view see the selection. Thank you for your inquiry! What type paint/stain did you use on the frame? BEST ANSWER: Hello! Thank you for your inquiry. The frame is made of eco-friendly upcycled fibers with a wood grain overlay as the finish. Please let us know if you need help finding what you need. Thank you for reaching out to us. Happy Framing!